The Journal calls Houghton a major textbook publisher, and the company says it’s been hurt by state and local budget cuts to K-12 education programs. Fans of Tolkien know Houghton as the American publisher of The Hobbit and The Lord of the Rings. 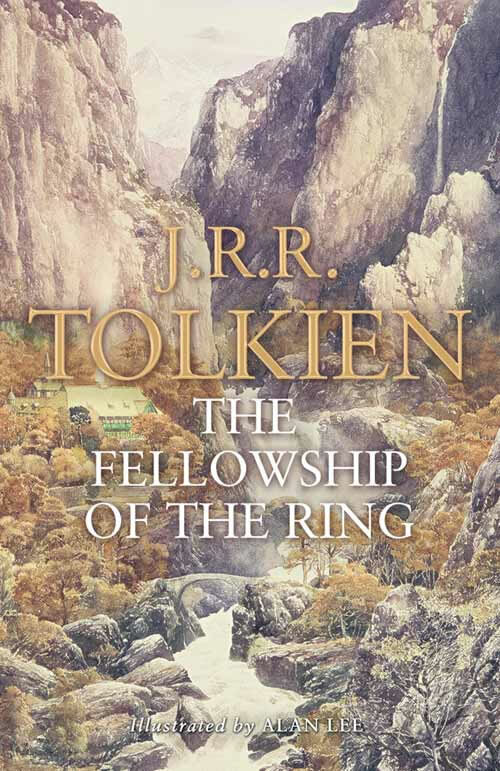 Several books I treasure are Tolkien editions illustrated by Alan Lee, artistic director for Peter Jackson’s movies, whose drawing and paintings shaped the films, and in some cases, served as the the actual backgrounds for outdoor scenes. These are kind of books I treasure as print editions. At the same time, it’s easy to imagine a transition to ebooks could be a business saving move for the textbook division. Industry watchers knew Houghton was in trouble as early as 2008, when it temporarily suspended new book acquisitions. It’s hard to believe they are the only traditional publisher that is struggling for survival. This entry was posted in Books, Publishing and tagged books, ebooks, economics, publishing. Bookmark the permalink. I keep waiting to read that publishers will narrow their paper focus: maybe they should keep libraries alive and well-stocked? Maybe they will become vinyl records and market to aficionados, collectors, and purists? Paper isn’t dead; it just isn’t the A-list anymore. With eReaders getting down to less than what I paid for a single college textbook decades ago, it ought to be feasible. There are dueling formats in the ebook world, reminiscent of the initial PC operating system wars, 8track – cassette or VHS – beta duels. This will probably have to be ironed out somehow, but it could have been done by now if the publishers had spent any time working on the issue. Instead, they did like ostriches. Libraries are another place where I enjoy paper, in large part, because ours is a quiet refuge. Browsing the stacks and the magazine racks, I find things to read that I would have missed otherwise. Also, the last time I tried to checkout one of their ebooks, I couldn’t get it to work. No question the big publishers have to make moves to ebooks and textbooks are the most logical move to be made.I agree with complynn. I would have given anything to have up-to-date texts available for my students in a form that wouldn’t break their backs carrying them home. The time is here. But I sure don’t think ALL books should be in ebook form. I love the feel and smell of paper books. I sure hope Houghton Mifflin finds its way through this mess. It seems increasingly clear that publishers need to find a way to embrace rather than fight ebooks to survive. It’s most unfortunate that economic uncertainty in all quarters is making coherent action like that so difficult. I hope Houghton survives too!